Ulverston’s Town Beck gathers water in the hills to the north of Ulverston before losing height rapidly – over 100ft in less than a mile – on its way to the Leven estuary at Sandside. 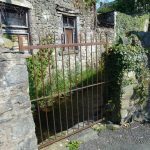 It has long been of great importance to the town – not only supplying water for domestic and commercial use and taking away the waste from such premises, but also acting as a source of power for a variety of industries which are the focus of this walk. 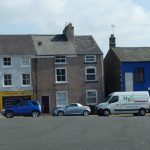 These notes are largely based on a fascinating handout called Ulverston – Milltown which was given out by Mike Davis-Shiel at the Cumbria Industrial History Society’s conference in Ulverston in 2006. As usual Mike’s A4 handout was the result of years of research using sources such as directories, newspaper adverts, maps and old photos. He took photos of much of this material and this – along with many original photos that he himself took in the 1960s onwards – has all been digitised by the CIHS and can be seen on the Cumbria Archive Service’s on-line catalogue. 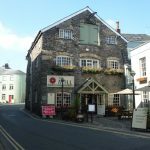 This walk looks at the locations and remains of the water-powered mills and other industrial premises in three areas – along the mill race to the Town Mill; through the town centre; and around The Ellers. It follows a route devised for the CIHS in 2015 by Dan Elsworth and Roger Baker, who took the photos, and is about 3 miles long. 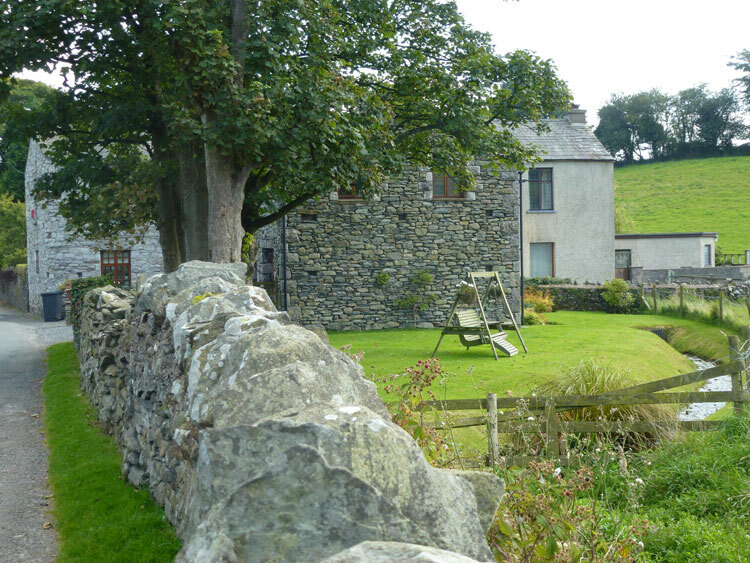 Start from The Gill car park and head out of its narrow end, following the Cumbria Way signs to walk alongside the Beck. After passing the old laundry for Stonecross Manor on your left, ignore the left turn over the bridge and carry straight on. 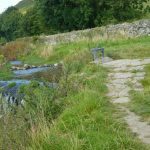 The path gains height above the Beck until you pass through a kissing gate into a small field. Cross the field to the kissing gate at the far side. Along the mill race to the Town Mill. 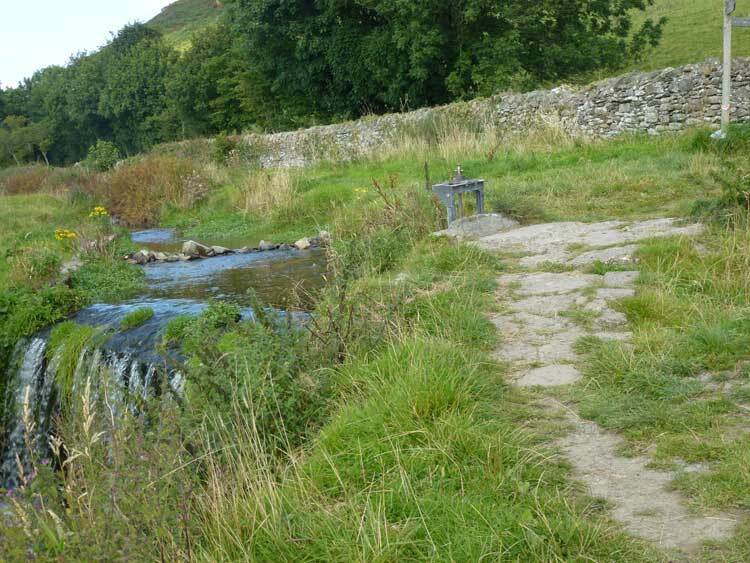 The mill race is taken off the Beck in this field on the northern outskirts of the town and runs for over half a mile some distance to the east of the Beck itself before rejoining it in the town centre. Turn right when you pass through the kissing gate and follow the road. 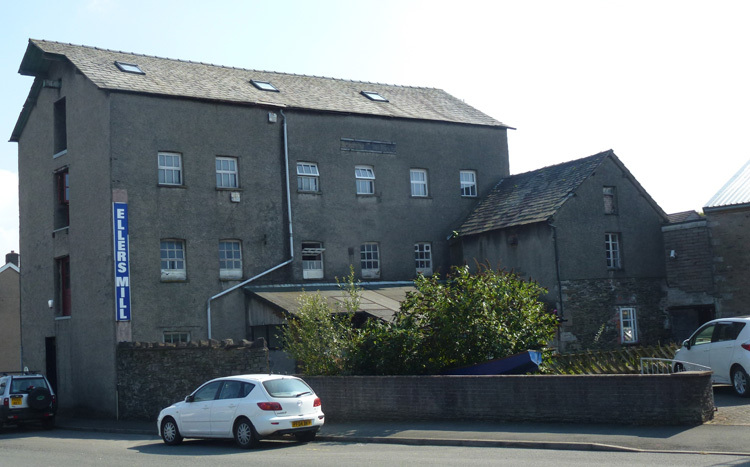 High Ure Mill (now called Candlewyck) was referred to in 1796 as a “candlewick factory” and in 1825 as a “candlewick mill” before appearing as a “candle factory” on the 1st edition OS map. It’s still not clear what was made there – candlewick bedspreads from cotton, wicks for candles, or candles themselves? 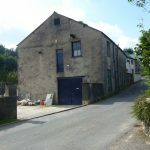 Low Ure Mill (now a builder’s workshop and store). 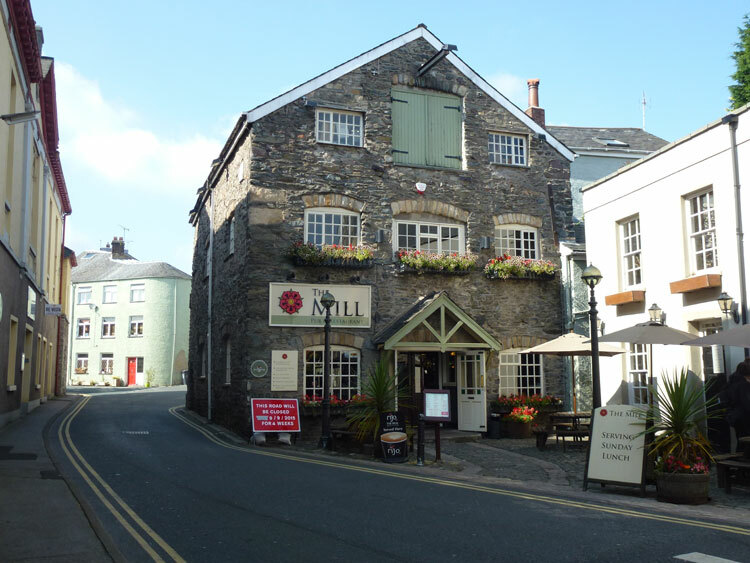 A corn mill most of the time (and confusingly referred to as the High Mill when in the same ownership as the Town Mill – the other corn mill lower down the race). Also recorded as a brush mill from the 1850s to 1870s, and as a foundry making shutter parts for a workshop in another part of town. 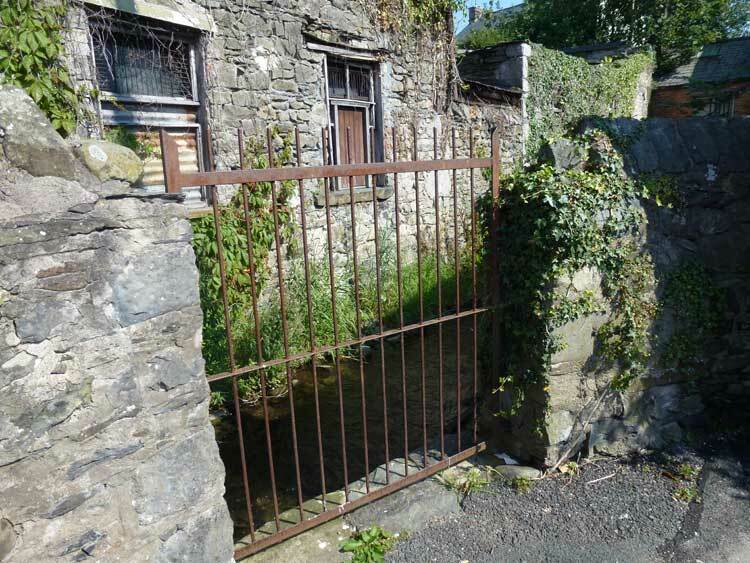 The datestone on the side of the building just inside the gate probably shows 1719 but could be 1679 or 1779. The mill pond was in what is now the garden of Candlewyck above. The mill race is culverted behind the mill and the new houses. Take the first right into Mowings Lane. Notice the open race over the wall to your left in the dip before the road rises. Take the first left into Garden Terrace and follow it downhill to reach the children’s playground. Mill Dam. Just before the playground is The Pound, where stray animals would be held until they could be reclaimed by their owners. The playground and the neighbouring flats were built on the site of the Mill Dam. 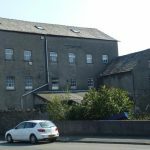 Water was held here to give a constant supply to the Town Mill, but was then available for other works around the water’s edge, including a bleach factory and tripe works. Don’t think too deeply about where the waste products went! Notice the re-emergence of the mill race next to the entrance to the Mill Dam flats. 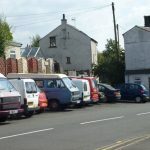 From there it flows under the road and continues – maintaining its height – under the parking area at the side of Stanley Street and at the ends of the back gardens of the houses above along Soutergate, mostly culverted. 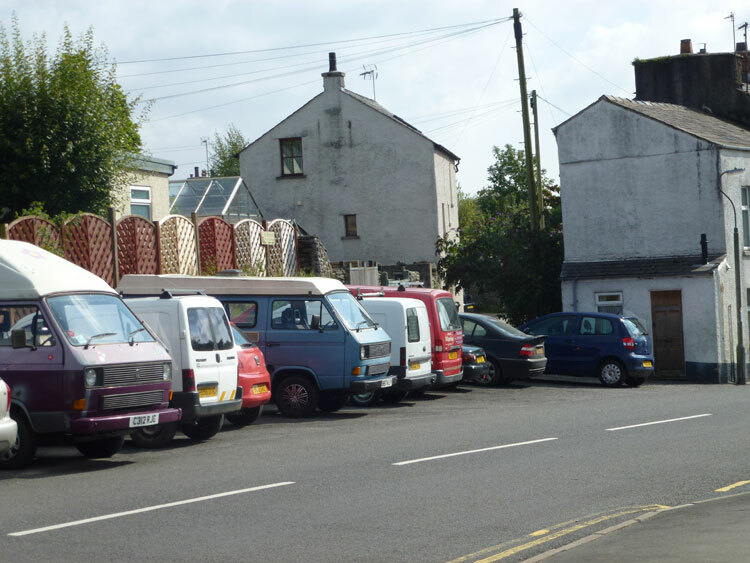 With your back to the Mill Dam flats head down Stanley Street and bear left down Mill Street once you reach The Gill. Town Mill (now The Millers public house, with a wheel and some machinery visible inside). First mentioned in 1678 but may be centuries older than that. 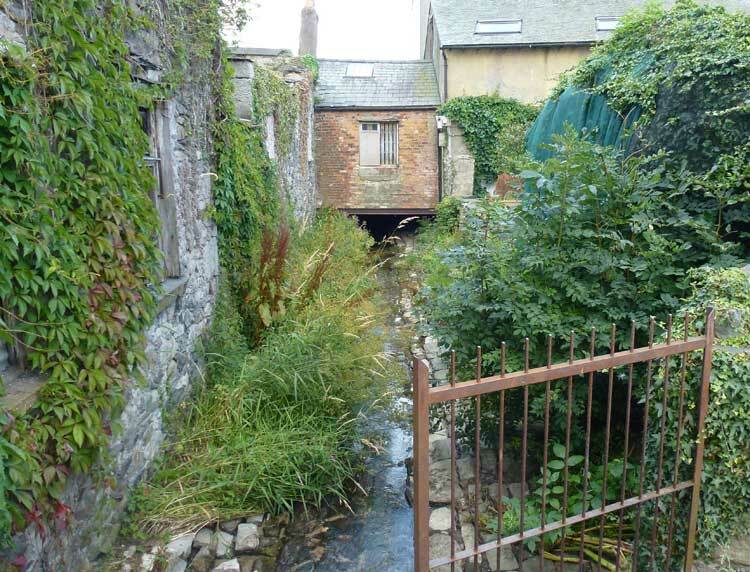 The mill race reached the rear of the mill at a height sufficient enough to power an overshot waterwheel before rejoining the Beck in the street below. Before the Town Beck (now culverted) is rejoined by the mill race it had already supplied water to a tannery in The Gill (hence the name Leather Lane) and probably also for some purposes to the New Brewery of 1832 (site of the Factory Shop). 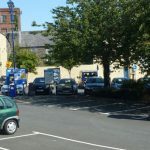 From the end of Mill Street cross over King Street (the main road through the town until the late 1960s) and turn left , round the corner by the mini roundabout, before turning right into the Buxton Place car park. This was once a jumble of houses and commercial premises. Industrial users here included a soap works, and a tannery dating from the 1700s. 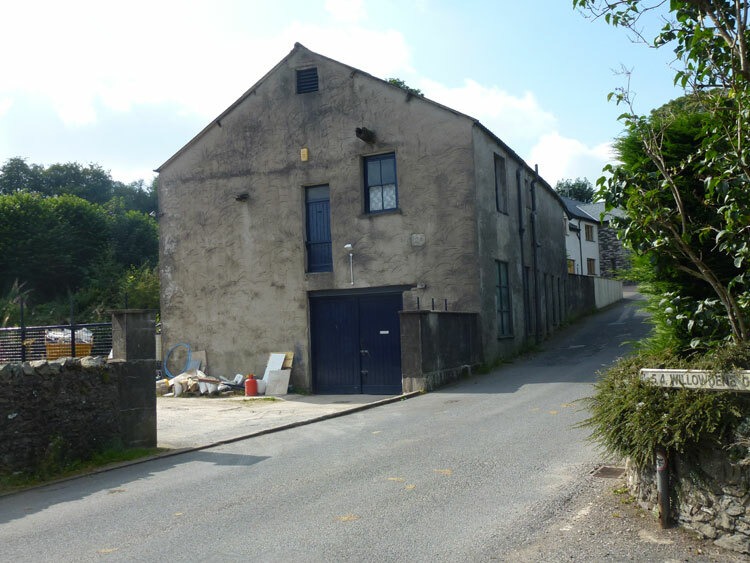 From here the Beck (of which an open section can still be seen at the east end of the car park) crosses under Union Street to reach the site of the Brewery Dam. To reach the Brewery Street car park leave Buxton Place at its far end along Little Union Street, and go straight across Union Street along Union Place. 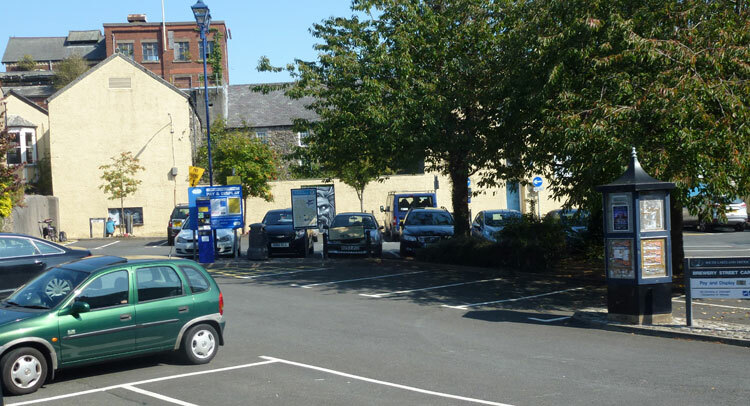 The Brewery Dam occupied the part of the current car park across from the Old Brewery (which famously became Hartley’s but is now awaiting demolition). The walk continues down The Ellers which is on the far side of the A590 roundabout..
Around The Ellers. Two streams exited the Brewery Dam to flow across what is now the A590 to serve both sides of The Ellers which was the route of the turnpike in and out of Ulverston. Nothing remains of the mills that stood to the north (left for us) of the road (known as High Ellers), including the large paper mill of 1835 to 1882 which was variously powered by water wheels, steam engine and water turbines fed by that branch of the Beck. However, on the south side (known as Low Ellers) – behind which you can see the open Beck at a couple of points – there still remains what is now Ellers Mill but was originally Low Ellers Low Mill. 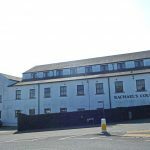 A fulling mill, leather works and hoe-grinding mill at various dates in the 1700s, this then became a 5-storey cotton mill from 1774 with (in 1806) 4 double carding engines, 4 billies, 2 pickers and 27 spinning jennies. 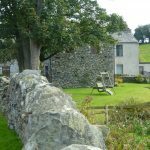 By 1874 it had been converted to a corn mill with 4 pairs of stones driven by an iron wheel and when needed by a 10hp steam engine. Although this burnt down in 1885 it was rebuilt as a 3-storey mill that continued to operate until the 1960s. Retrace your steps to the town centre. 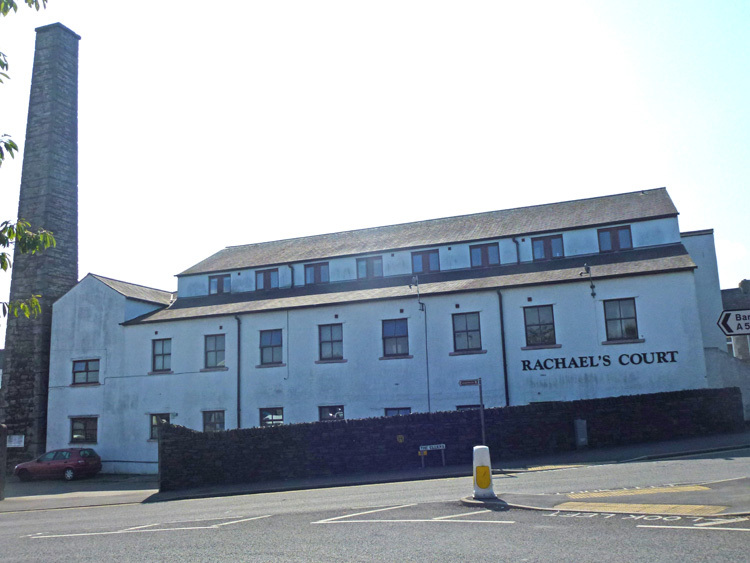 As you return to the town centre notice Rachael’s Court – now flats but once a water-powered cotton spinning mill then steam-powered weaving shed.